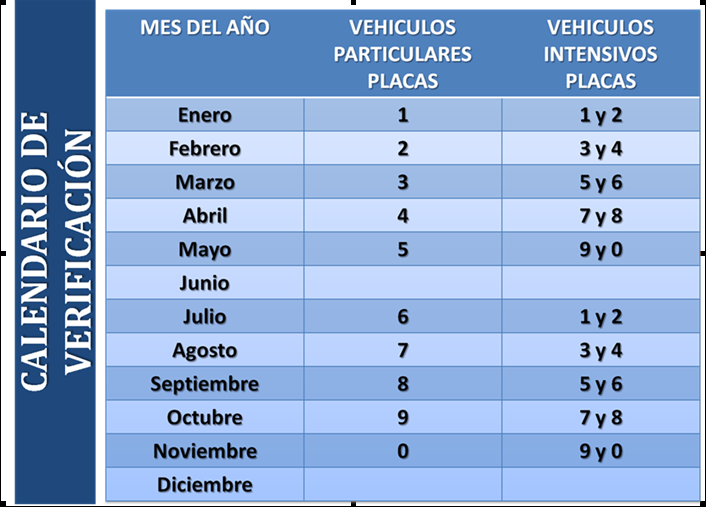 This chart shows what month you will need to have your vehicle emissions cert done depending on the last digit of your license plate number. On Vincente Guerrero in . Tested today, in and out in 20 minutes. My friend was due for it in August and didn't know. Is she allowed to get it done now or does she have to wait until next year? Any idea of what her fine will be and where she needs to pay it? She should just go and get it done. If her license plate ends in an 8 then it gets done in September (like mine). She's only two weeks late. 400 pesos in and out. I don't know of anyone getting a fine so far. I was pulled over the other day and they didn't say a word about a missing smog decal even though they were trying to nail me for something. We'll see if they are attaching any fines at registration renewal time next year. There wasn't any this year when I renewed both vehicles. ferret wrote: She should just go and get it done. If her license plate ends in an 8 then it gets done in September (like mine). She's only two weeks late. 400 pesos in and out. No, her license ends in 7, that is why she needed to go in August. Bob, I am not referring to a traffic fine but the one given for being late. It was stated the cost was $1500.00 and if never paid could be 3x as much. I guess she will find out when she goes to register in the beginning of the year. It was also stated in this thread that once late, could not get it done, so I am curious about that as well. Thankfully I saw this thread last night as I am due for the testing this month. I forgot about it also. Just go do it. There is no fine at the inspection station, and no fine unless you are stopped and ticketed for lacking the inspection sticker. So, go now and avoid that possibility. RVGRINGO wrote: Just go do it. There is no fine at the inspection station, and no fine unless you are stopped and ticketed for lacking the inspection sticker. So, go now and avoid that possibility. Gringo, I am not the one with the problem, I am still timely as I am due this month. It is my friend who has the problem and me, I was going by what had been stated here, just wanted to verify for her. Does anyone know if they've completed work on Zaragosa? Its hard to understand how the town could drag out street repairs for well over two months! Work not completed but you can drive down the street...CAREFULLY. SunFan wrote: Does anyone know if they've completed work on Zaragosa? It's not just street repairs....it's installation of new sewer lines, sanitary and alluvial, and underground power lines. Different entities involved. Googling around tells me that the new enforcement regime has failed to take off again this year, so no fines. They say it will come in 2018. Apparently the level of compliance is under 30% and falling. It (compliance) will pickup dramatically when owners are penalized at refrendo renewal time at a cost of more than 400 pesos. slainte39 wrote: It (compliance) will pickup dramatically when owners are penalized at refrendo renewal time at a cost of more than 400 pesos. they have been threatening that for the last 5 years, it will not happen this year or next. Well the payment of multas for moving violations sure picked up once they started adding it to the annual refrendos for non compliant payers. Record income from camera generated speeding tickets. Pay now or double later. Speaking of which, I haven't seen the tripod camera around Ixthulacan for quite a few months. There was talk that these were unconstitutional and Spencer had mentioned that you could dispute these tickets. I think they only have so many cameras and they get moved to other locations for surprise and effectiveness. They will return when drivers forget about them.....you know, gold fish memory. The ticket is probably cheaper than hiring an attorney. I think so too as I haven't seen them on the Perferico anymore either and believe me if they are there I get nailed......just ask slainte. I agree, that is the last I heard too. CanuckBob wrote: I think so too as I haven't seen them on the Perferico anymore either and believe me if they are there I get nailed......just ask slainte. It/you got so bad that I quit keeping score. We had to implement the "20 run rule".....an old softball term for those not in the know.